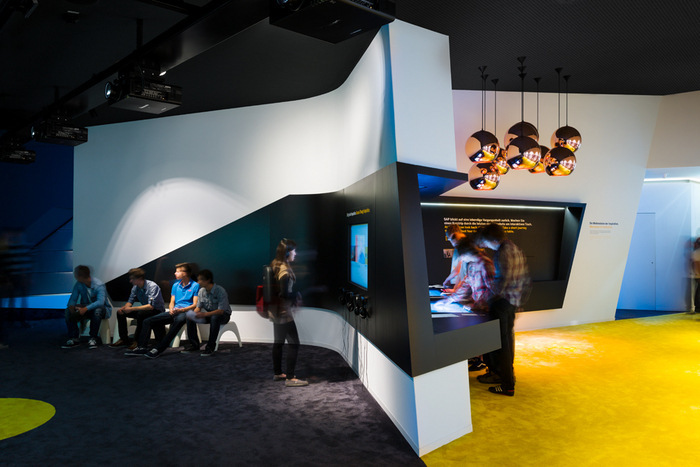 Last week we featured the amazing new SAP offices in Walldorf, Germany. Today, we’ve got an exhibition space the company put together to showcase their brand for visitors. We’ve seen a number of companies – Blizzard for one – that have built spaces where visitors can go to learn about the company, without having random people perusing through the office. “”40 years of future” is an interdisciplinary project for the 40-year anniversary of the software company SAP, Walldorf. The past, present and future of the company are demonstrated in a multimedia exhibition. The concept and the interior design of the temporary exhibition building was developed by the Stuttgart architecture office SCOPE. The project was completed successfully after a six-month planning and implementation phase in close cooperation with the ARS electronica Linz media artists and the Dusseldorf communications agency EURO RSCG. The architecture of the pavilion is being greatly influenced by its position within the inner courtyard of the SAP Headquarters. SCOPE designed an envelope figure in a four-sided enclosed area of 28 m x 33 m, which on the one hand reflects the introverted character of the utilisation and on the other hand interacts in an exciting way with the confining environment. The cubic volume of the building is divided into two polygonal bodies, which seem to break their static boundaries and fuse together in an opposite movement. The two bodies react by their different heights and shapes with the programmatic structure of the exhibition. The lower black building penetrates the glass facade as a connecting corridor to the lobby of the Headquarters. The white, jointless body innerly absorbs the exhibition space with the three thematic areas. Both bodies are covered with a seamless PU-coated seal that underlines the form of the polygonal body. Filigree, black wooden strips adapt their course of line to the entrance and mantle it as a second skin. The wooden strips create a further differentiation between the bodies with their fine structure.